Interests - Being the centre of attention, kissing and sensory lights. Visually/hearing impaired? - Yes - Delcan has 70% hearing loss in one ear and 30% in the other. We are very sad to say that Declan passed away at 1.05am on the 15th December 2008. Declan was born on the 7th May 2002 one hour overdue! He was born healthy and we were not aware of any problems until the 15th August 2002 when I walked into his bedroom and he appeared to be very grey and “vacant”. We were admitted to hospital over night as a precaution and from one in the morning until 9am Delcan had a grand mal seizure every hour. A loading dose of phenobarbitone was given and thankfully all seizures stopped. We were sent home and were back into the hospital a week later when it all began again. 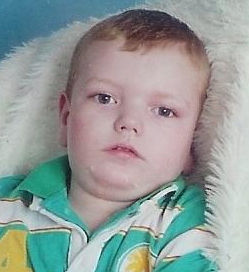 An MRI scan was given where it was made clear that Dec had a severe brain disorder and would need 24/7 care. By then all that didn’t matter as we had bonded with our angel and we wouldn’t change it for the world. People dream of seeing Angels, we are lucky we have one in our lives. I’d like to thank everyone at Post Pals for all their kind words and messages over the loss off our sweet baby boy. Declan had deteriorated a lot over the last few months and had practically been living at the hospice and if he wasn’t in the hospice he was in hospital. On the 12th December he was taken by the Paramedics to our local Hospital where they discovered he had a double pneumonia in both of his lungs. He was transferred to the Hospice the same afternoon when he started to deteriorate in the early hours of Monday the 15th, he was simply too tired to fight anymore. I had a lovely long cuddle with him in bed, then Brendon got into bed with him also and then he gave 3 of the tiniest breaths and went to sleep forever. We are very sad to say that Declan passed away at 1.05am this morning. So sorry for the long update on Declan but things have been really busy and hectic over the last few months. I want to say a big big thank you to all who have send cards and surprises to the boys. Kyle has really enjoyed the Horrid Henry books he received for his birthday yesterday and a surprise parcel arrived this evening which i think is for Christmas so I’ve hidden it!! Declan has been having lots of problems with his health and now has a movement disorder which is very unpleasant and uncomfortable for him. He is also experiencing very frequent seizures. So even though you may not hear from us very often we want you to know how very thankful we are!! Golly it’s been such a long time since i did an update on my Little SUPERMAN! Firstly i want to say such a big “THANK YOU” to all those that have sent Declan cards and letters, it really means a lot to us and i read them all to him as soon as they arrive. I know you all wonder if he received them and even though i don’t reply your thoughts touch us, so please never think that goes unnoticed! Declan’s condition over the last few months has been declining and we have seen more and more of the old Dec slip away, but he’s very much with us! It just means he needs a lot more help and care and his symptoms are being treated as they arise. Thank you to Viks for the wonderful tickets for Thorpe Park i am sure they will be used before the summer is out and we will make sure the guys take a picture for you. Once again THANK YOU everyone! My word what a hectic, worrying, stressful time we have had the last eleven days. 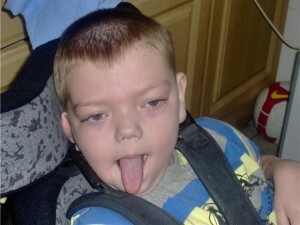 Dec went into the Hospice eleven days ago for symptom control regarding his seizures. Whilst in there, he came down with a sickness and diarrhoea bug which caused him to vomit. This was so scary as Dec has not ever had a virus like this. Unfortunately, when he vomited, he aspirated and this went straight to his lungs causing Pneumonia. This is very bad at the worst of times, but as Dec is no longer for iv medications, it was a very scary time. The first lot of antibiotics they gave proved to be unsuccessful, so we went in blind with a second course which thankfully are doing their job! Thank you for all the kind words, thoughts and cards, especially from Karen (sami) and to Julie Barrett for the wonderful and truly amazing bear that you sent Dec. I know it shouldn’t have been opened until the 7th but we couldn’t resist! It’s fantastic and as Dec can’t speak when he shouts the music is brilliant! Declan keeps me well and truly busy. After late November when he was really poorly, things have been non stop. At first we thought it was the Phenobarbitone because Dec changed completely (new movements, less and less sleep etc) but we couldn’t complain as the strong and nasty seizures were kept under control. Slowly but surely they are returning once again and it has been non stop action here with him having no sleep at times and requiring sedatives to settle etc but I’m not complaining as i have my little man and i will handle what ever comes my way. Sorry for the lack of updates over my little pickle, Declan has had a really hard and rough few weeks to say the least and as you know we have been kept very busy in our house! As you were aware Dec has taken a bit of a decline in his condition to say the least, seizures were so out of control and he was requiring emergency medication at least twice a day! A new medication was introduced but he was so allergic to the medication that his reaction was so severe it was withdrawn immediately. Since then he has been placed on a new medication via a syringe driver which was given continuously over a 24 hour period. This seemed to take effect and over a week later he was off that and able to take this medication via his gastrostomy tube! All this excellent care was taken place in the hospice where he was resident for nearly three weeks. He had been poorly over Christmas but touch wood after a few days back in the hospice he is now back at home! Thank you all so much for the wonderful gifts he and Kyle received, sorry for not mentioning names personally but it was manic here over Christmas and i cannot locate all my details of thank you’s that i was intending to send out! Declan has been in the hospice for the last few days and yesterday we went to see Dec’s consultant at the hospital. My little man has taken a rather large decline in his condition and is getting very tired. He is unfortunately heading towards total palliative care and end of life care. He has basically reached the next stage but it is not there yet, thank God. He is requiring lots of extra help and our main aim is to keep little man comfortable and calm. He is still sleeping the days away but has also some wakeful spells where lots of kisses and cuddles are given. What a busy month we had in September! Declan (a.k.a Pylon Pants) has been a real tinker after a relatively good summer. We have been in and out of the hospital, in and out of the hospice, on oxygen then off oxygen etc! He started with the new med (Euthsozimide) being introduced and had an allergic reaction to that (apid breathing and even worse seizures than before). He had a bout of status (constant seizure) was given first dose of Paraldehyde (drug) and reacted badly to that so was rushed to hospital, caught pneumonia and then got croup!! Had a few days of calmness and serenity, but now winter is nearly here and the surprises are never ending!! Thank you for all the parcels that Declan and Kyle have received! We went to the hospice in the early hours of this morning as Declan just couldn’t do it on his own and was struggling a little. They have put him on two strong different antibiotics and oxygen and things are now stable. So, hopefully, in the next 24 hours he should turn around, but because he can’t have IV’s anymore it’s always a frightening time. Just to let you know that Declan has been really struggling with his breathing today and was diagnosed earlier with a very bad chest infection/pneaumonia. As Declan is to be treated only with oral anitbiotics, I ask you all to send lots of good wishes Declan’s way and pray these antibiotics work. If not, we can transfer Dec to our local Hospice where they will try to keep things under control. Thank you so much for all the good wishes and cards Dec and Kyle have already received. Big thanks to Kate, Julie, Luke Jones and Cathy and Bobby Etherton for all the lovely gifts, post cards and letters that Declan and Kyle have received in the last few weeks.